In honor of World Environment Day, environmentally conscious offices strive to eliminate traditional fax machines and rid the environment of their hazardous effects. But how can you swiftly kill something that won't die? 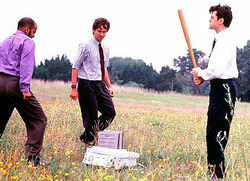 Characters from the movie Office Space obliterate their fax machine. On June 5th, the globe celebrated World Environment Day, an event heralded by the United Nations Environment Program (UNEP) and celebrated by more than 100 countries. And in honor of the occasion, Austin-based company Zilker Ventures pledged to UNEP that they would switch as many offices as possible from traditional fax machines to Internet fax in 2008. "People are sometimes reluctant to switch over to E faxing from fax machines simply because they don't have the necessary information about Internet fax services--that's what we try to provide," says Gaines Kilpatrick, CEO of Zilker Ventures and co-creator of FaxCompare.com, a comparison and review website for online fax services. But leaving the fax machine behind is a process. Whoever said that fax machines aren't really dead may have been right. How can you kill something that won't die? In the wake of new Internet fax services, such as eFax, MyFax and Ring Central, reports have surfaced of fax machines tucked into dusty office corners, hidden from sight, but still running and often used by businesses professionals who have not yet seen the light. Remember the final scene between Louis and Lestat in the 1994 movie Interview with the Vampire? Years after he's explored the world and all it has to offer, Louis returns to a decrepit New Orleans house to find Lestat, the vampire who sired him, hiding in shadows and living a miserable existence. Lestat asks his former companion to rejoin him, but Louis refuses, obviously having moved on from a purposeless past. Traditional fax machines and offices are not unlike Lestat and Louis. For years people have regarded their old fax machines with the same disdain that Louis has for Lestat, and now, businesses are parting ways with their long-used standards. Experts call them "vampire loads"--energy-sucking devices that still consume wattage while lying dormant or idle--the most notorious of which is the fax machine that needs to be kept running in case it receives a fax. According to DJ MacIntyre, President of renewable energy advocate Le Boisé Alternatives, "If you run a fax machine 24/7, you create 80 Kg of greenhouse gas per year in our area. That's a lot considering how infrequently it's actually used." Greenhouse gases lead to global warming. Global warming leaves polar bears stranded on ice chunks. And the rest is history--literally, the most alarming environmental crisis in the books. In addition to consuming energy, fax machines also use paper, which is too often wasted on unnecessary cover pages, fax reports and faulty fax transmissions. Internet fax industry leader MyFax recognizes this fact, reporting that "[if] 1% of all paper faxes sent in America each year were sent electronically, 73.5 million trees would be saved." Of course, there have been naysayers, people who have touted phrases like "the myth of the paperless society," and arguments that electronic mediums have only increased paper usage. But while paper waste has indeed proliferated in recent years, studies are now showing a decline. The speculated reasons have been various. Perhaps the post-Inconvenient Truth generation is simply becoming more serious about going green. Perhaps people are also more quickly embracing electronic copies, which can be saved on a computer or PDA and do not have to be printed. This mobile aspect of email and electronic documents is appearing more and more desirable and environmentally responsible to consumers. People are also becoming more comfortable with Email fax or E fax services, especially since the majority of email servers and Internet fax sites provide secure archives of stored information that can be accessed "anywhere one can access the internet." Though there is not yet a paperless society, there is, instead, a myth that traditional fax machines are still desirable. But the truth is that the world is moving much faster than the naysayers would have people believe. Network connections are becoming more secure. Consumers are buying iPhones and Blackberries, carrying hundreds of electronic pages in their pockets. And we are supposed to believe that using a paper-jammed, whirring, buzzing energy-sucker is faster, more reliable and more convenient than the alternatives? "[A] lot of people are surprised to see how easy it is once they get going," says Steve Adams, Vice President of Marketing for Protus, owner of MyFax. If the fax machine is still alive, it is, like Lestat, prone to abandonment. As MyFax says, "Fax online. Save a tree." It doesn't get any simpler. For additional information regarding online fax services, visit FaxCompare.com.